What's so special about a black moon? Well, black moons are very similar to blue moons as well as being the exact opposite. Black moons only appear if there are two new moons in the same month. You may not exactly be able to see the black moon since technically new moons are the first phase of the cycle which usually means you won't be able to see it at all. However, despite not being able to see the black moon in the sky, you will definitely feel it's tremendous energy pouring throughout the universe. You will see all of the steps necessary for success and all of the things you will discovery about yourself in the process. Do not shut out new ideas because there will always be more than one point of view that you're not seeing correctly. It is also a good idea to balance yourself with all of your negative and positive emotions.If you are entering into this major shift with negative thoughts then you can reverse the feeling instantly with the help of the black moon. The energy is so great that you probably aren't going to be feeling any kind of negativity in the first place. However, it'll help you all the more if you are able to adjust your way of thinking into something productive as well as beneficial in order for you to truly experience the raw power that the black moon exudes. Keep your eye's open for any new opportunities that present themselves to you. 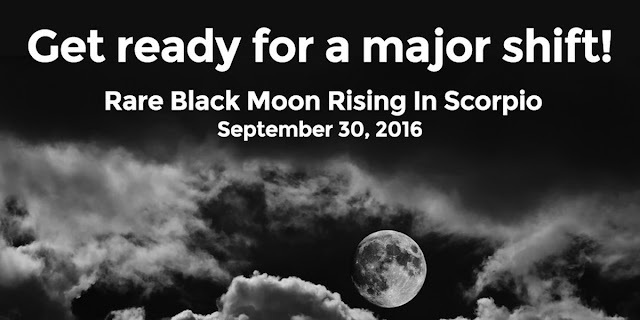 With the black moon rising, you will want to make every single change possible. This will allow you to move on further into your life as well as accomplishing something that you've been working really hard on for a long period of time. Allow yourself to experience new beginnings as well as coming to an end with some of the old things that you've been dedicating your time to these past months. Essentially, in order to prepare for the black moon, just be as open as you possibly can.Be open to new people, new places, new ideas, new homes, new friends, just about everything! This shift is going to be huge!